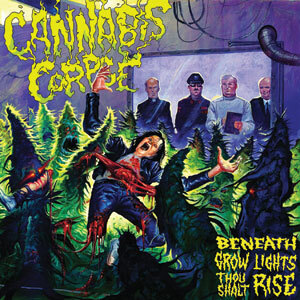 Cannabis Corpse will never be taken too seriously because they’ve cribbed their identity and sound from early to mid-90s Florida death metal and habitual marijuana consumption. And the Virginian bong-barnacles may always be thought of as bassist Phil ‘LandPhil’ Hall’s side-project from Municipal Waste. But - and it’s a capital 'B' but - death heads who’ve gone white and sick at the thought of Morbid Angel’s tepid return can at least throw themselves into this lovingly crafted and chronically old-school celebration of the genre, and low, their faith in a lifestyle of rolling joints and spinning ‘The Bleeding’ will be restored. A tongue-in-cheek faceripper.